In the elections of May 10th, three levels of representation are chosen: Government Board and Dean at the level of Catalonia, Demarcation Boards in the six Catalan Councils and representatives in the six demarcations. 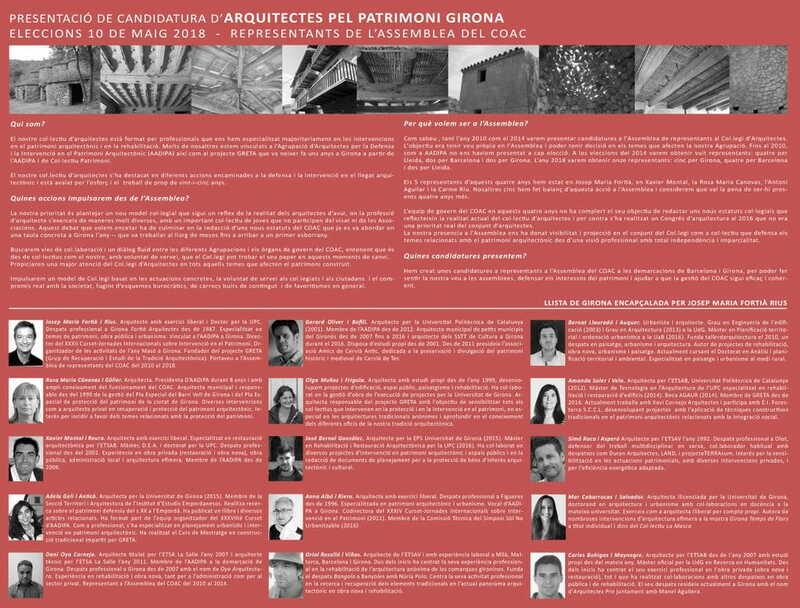 From Girona we have presented a candidature for representatives to the Assembly called "Arquitectes pel Patrimoni" (Architects for the Heritage). We are a group of architects that work basically in projects related to architectural heritage, urban planning and public works. The purpose of this candidature is to propose to the Assembly the debate about a new college model. Our priority is to make a more plural school, reflecting the diversity of the architects collective. Rosa M. Cánovas - Xavier Montal - Adela Geli - Dani Oya - Gerard Oliver - Olga Muñoz - José Bernal - Anna Albó - Oriol Roselló - Bernat Llauradó - Amanda Soler - Simó Roca - Mar Cabarrocas - Carles Bohigas.